Colorado shares a major portion of its region with the Southern Rocky Mountains and with the Great Plains. This makes the region filled up with both cooler mountain terrain and flat grassland. Loose and mammoth rocks cover these mountains. While some mountains are tall enough to have snow throughout the year, others are within climbing efforts. Not surprisingly enough, some of these mountains have small ponds at the very top, making a water source for lazy creatures who do not wish to venture too far into the wild. The state is a home to many large animals. This region has mule deer, herds of elk, mountain goats, and white-tailed deer. Grizzly bears and moose are also present in the region, though they are not as common as other animals mentioned above. Other predators such as black bears, mountain lions, wolves, bobcats, and coyotes are in present in the wild. Though these animals occupy the mountains and the forests, there are critters that also enjoy the grassy plains. Prairie dogs, pocket gophers, rabbits, bison, ground squirrels, badgers, and pronghorn deer are also in abundance in this region. The state is also abundant with nuisance critters. Many people have problems with skunks, beaver, armadillos, squirrels, opossums, and raccoons. Colorado also has numerous beaver. The state often warns hunters and tourists about the dangers of “beaver fever” which is known to cause intestinal discomfort caused by the microscopic organism called giardia. They are not encouraged to drink water from the mountain stream until they reach a certain elevation. Colorado also has several invasive species such as Zebra, rusty crayfish, and Quagga mussels, infiltrating the streams and giving environmental agencies a hard time. The state also has a non-native creature, the New Zealand mudsnail. They attach themselves to boats, easily move between water bodies, and then disrupt the ecosystem by feeding on aquatic vegetation. Opossum in Denver, CO: These animals come out at nighttime, perhaps in search of your garbage. They will live under your porch and will steal your pet’s food. They are not beautiful looking animals, however, a great Colorado survivor. Raccoons in Denver, CO: These veiled creatures are common in Denver, CO. They steal pet food and raid through trashcans. They live in the attics and the chimney of your home. They look cute, but often become nuisance to the locals. Snakes in Denver, CO: Denver has many snake species, but only few of them are venomous. Browse this site if you need help identifying the snakes of Colorado. Rat Control in Denver: Denver is home to Roof Rat, House Mouse, and the Norway Rat. They live in the walls and attic of a home and contaminate food. Read our blog on how to get rid of rats once and for all. Bats in Denver: Bats eat many insects and are useful mammals to human beings. However, if there is a bat infestation in your home, you need to take action immediately before the problem goes out of hand. Call a Denver wildlife and pest control team now. 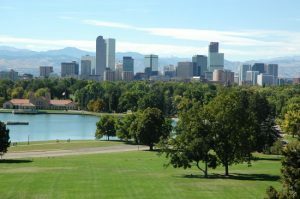 Squirrels in Denver: Squirrels are agile creatures and live throughout the year in Denver. They live in the attic, and chew on electrical and cable wires. Call a professional wildlife removal team if you need squirrel removal in Denver. “There are rodents in the attic! How should I get rid of them?” – Rodents occupying the attic are a common pest issues for many householders. They can easily find their way through even the smallest of spaces in order to find a warm and safe place to live and raise their families. Rodents are social and often live in the colonies. If you spot one rodent, most likely there are others too. The first rodent is probably a pregnant mom looking for a safe place to raise her litters. If you hear the running, scratching, and scrubbing noise, you will need to do some detective to confirm your suspicions. First off, you will need to know where exactly they are located and how they are entering your home. This could mean getting up early in the morning and noticing their comings and goings. This way, you will find their most popular entry points. Once you have identified their entry and exit points, place a trap there, baited and not set yet. For few days, leave the trap in place while you block all other entry points. This will compel the rodents to get used to the way that leads to the trap. Once all other entry points has been blocked, then set the trap and start catching them as they enter in your home.